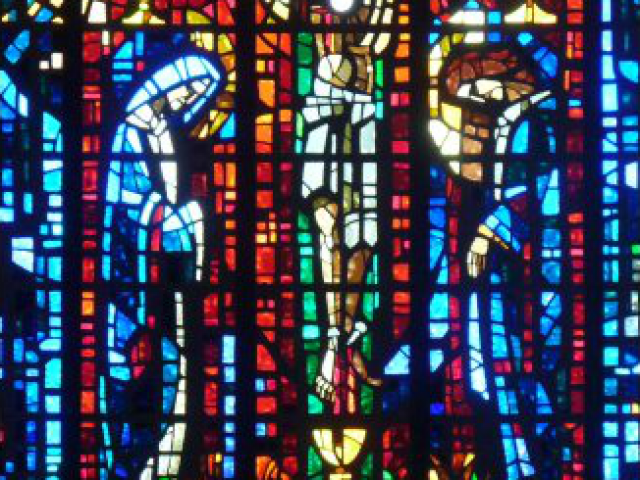 Gabriel Loire (1904 – 1996) was a French stained glass artist of the twentieth century whose extensive works, portraying various persons or historical scenes, appear in churches around the world. He founded the Loire Studio in Chartres, France which continues to produce stained glass windows. 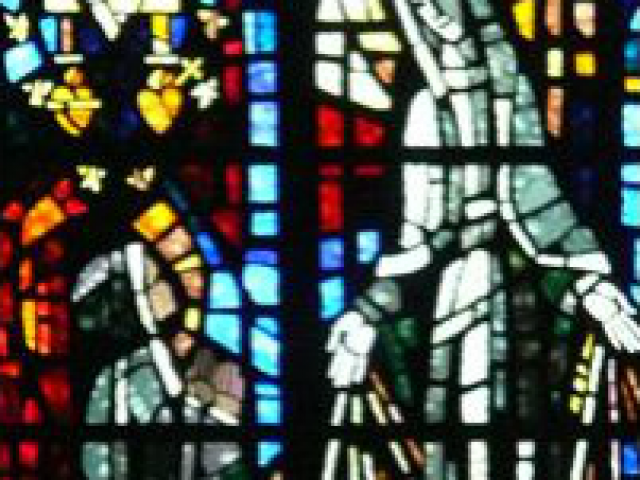 Loire was a leader in the modern use of “slab glass” (in French: dalle de verre), which is much thicker and stronger than the stained glass technique of the Middle Ages. The figures in his windows are mostly impressionistic in style. Loire was born in Pouancé, France, on April 21, 1904. 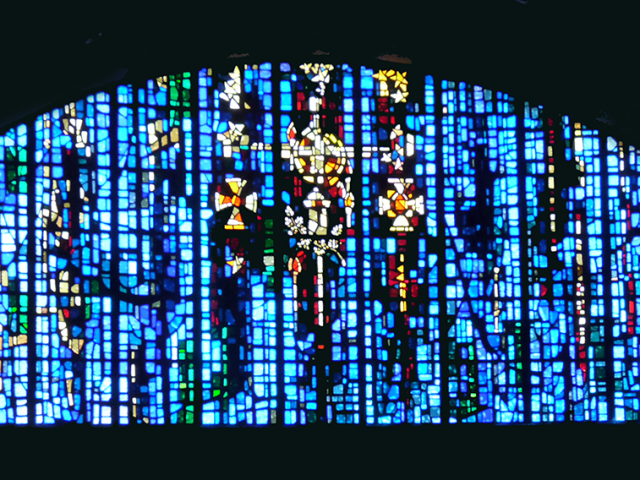 After completing his schooling in Angers in 1926, he went to a stained glass workshop in Chartres, France. 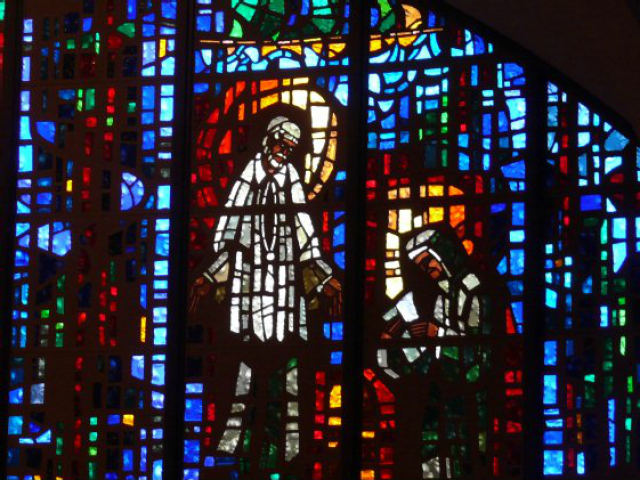 In 1946, he founded his own stained glass studio there, which continues under the direction of his son Jacques Loire and grandsons. 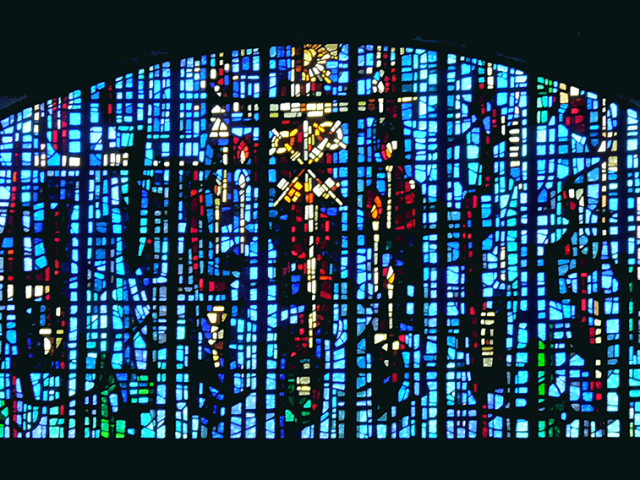 He died on Christmas Day, December 25, 1996, shortly after finishing a design for a new window. Loire and particularly liked working with shades of blue, which he said represented to him the color of peace. 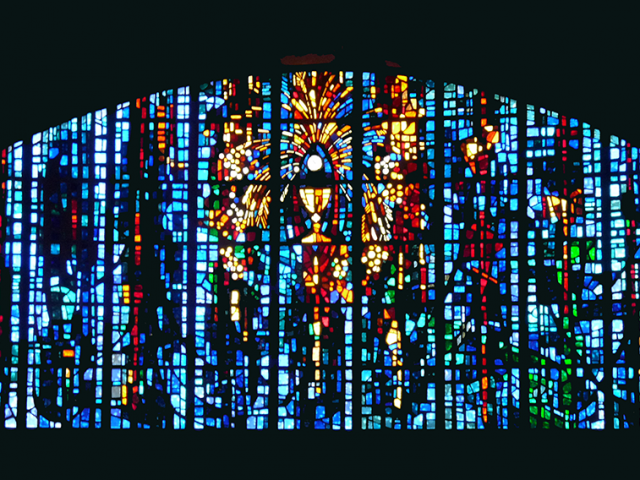 His stained glass artistry, blending modern and traditional elements, attained wide acceptance, In addition to more than 450 installations in France, Loire’s works are found in Great Britain, Germany, Ireland, South Africa, Japan, Chile, Canada, Australia and the United States of America. 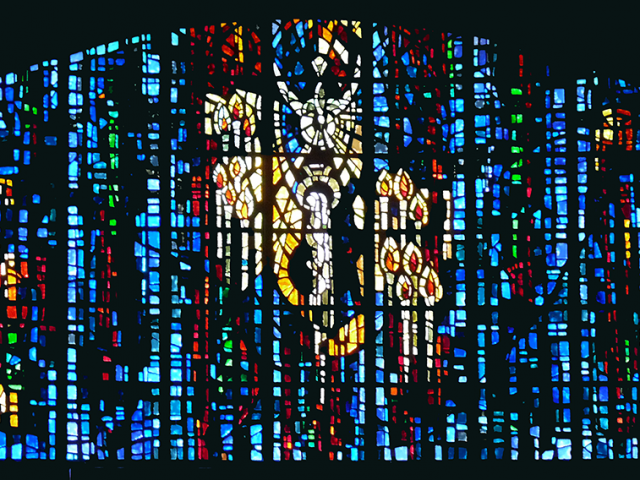 Monsignor Leo Beierschmitt commissioned Loire to design and craft the windows for the Shrine Church. 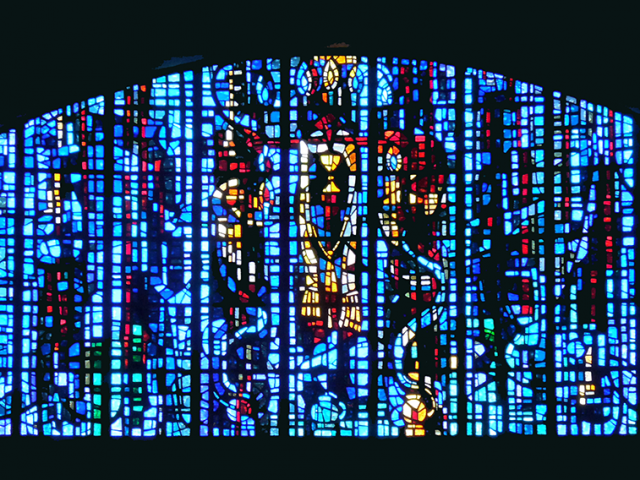 The windows were constructed in France and the shipped to Harrisburg to create a symphony in blue that adorns this House of God and home for God’s people. 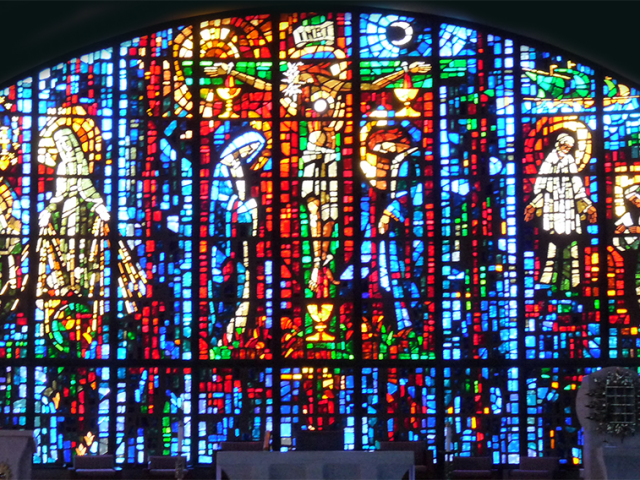 Behind the altar is the Main Window which depicts the Crucifixion of Christ in the Center, the Blessed Mother appearing to Saint Catherine Labouré are on the left, and Saint Vincent de Paul and Saint Louise de Marillac are seen on the right. Saint Vincent is handing Saint Louise the rule of life for the Daughters of Charity, religious community of which Saint Catherine Labouré was a member. .
Holy Spirit. On both sides are seven candles which symbolize the seven gifts of the Holy Spirit. A cross is shown with interlaced rings surrounded by lit candles. The four seasons of the year depicted in colors. Flowers and olive branches flow upward around the cross denoting the beauty and fruitfulness of Marriage. The Cross of Mercy is in the center with the Cross of Unction on the left and right. An Urn of the Holy Oil is shown along with branches (the palms). There are also lighted candles and the stars of heaven around the scene. a burst of the sun. The keys represent being set free from sin. The sun represents the new life and joy that comes from forgiveness. A chalice is surrounded by a stole (the symbol of ordination). 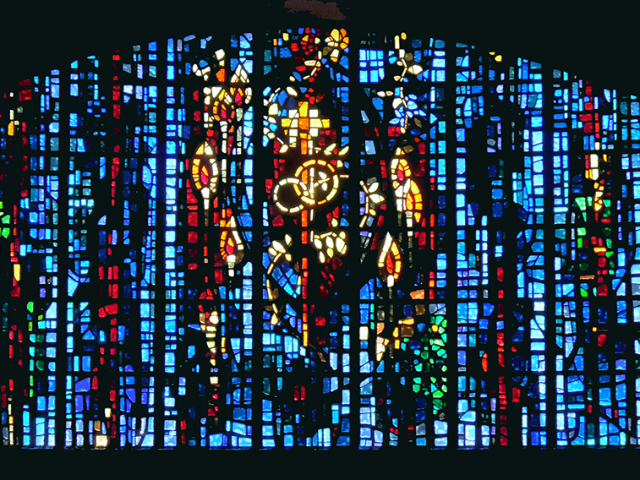 Candles are at the top center and at the bottom are three thuribles of incense with the columns of smoke rising throughout the center portion of the window. A chalice is shown over which is the Sacred Host, broken into three parts. Radiating from the host are grapes and wheat. At the right lower corner is a small cherub kneeling in adoration.